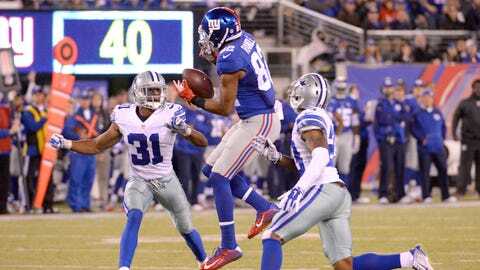 Rueben Randle made arguably the Giants' best individual offensive play during their Week 7 27-20 win over the Dallas Cowboys. New York Giants wide receiver Rueben Randle did his best impression of teammate Odell Beckham Jr. when he reeled in a one-handed, 44-yard catch in the team's 27-20 Week 7 win over the Dallas Cowboys. Randle made the tremendous catch over Cowboys cornerback Brandon Carr — the same cornerback who was victimized on Beckham's famous play. Randle finished with a team-high 68 yards receiving but only two receptions.